where the wild things are no. 13. stinging nettle and spring garlic soup. According to one of my very favorite books, The Dictionary of Gastronomy 1969 which offers concise little blurbs of information of all things gastronomic; “Nettles are a troublesome weed sometimes called stinging nettle. They are nourishing enough to eat if picked when young and tender. Country housewives cook nettles as spinach and in Eire, nettle soup is a specialty. Nettle beer is also made in some countryside districts in Britain." Though I won’t be attempting Nettle beer anytime soon, nettles have been on my mind since encountering the nettle and pecorino pizza at Pizzaiolo in Oakland last month. Nettles are not unfamiliar to me. My relationship with them, however, has always been a bitter one. As a country kid, left to my own devices, I had more than the occasional encounter with the tiny stinging welts that cover your flesh once you come into contact with them. In the summer, we kept several bottles of witch hazel on hand to combat just such encounters. Nettles grow in the tall grass, at the woods edge, in abandoned building lots and surround blackberry bushes as though they are standing guard against little hands of intruders. Nettles, have a long history as both a food source and a medicinal plant. 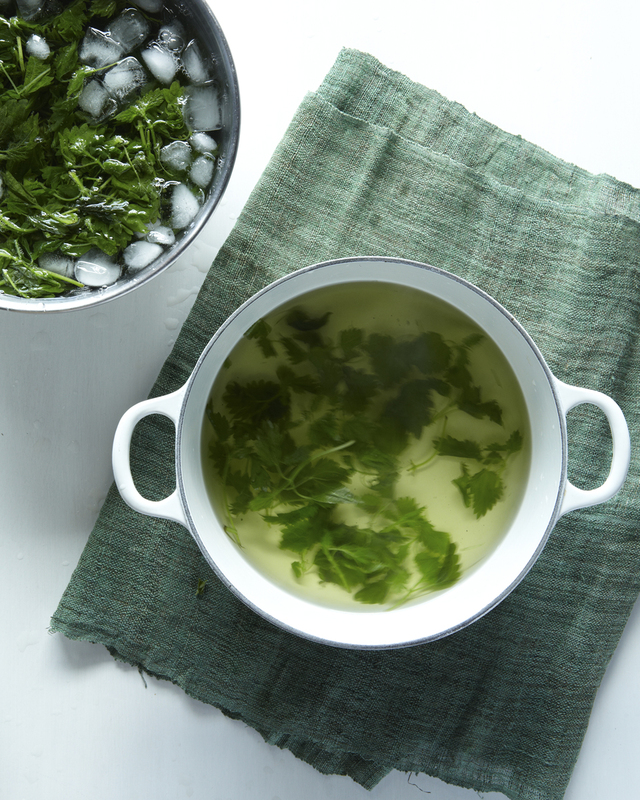 Perhaps you have the fairly common nettle tea or a nettle pesto? Nettles, which must be blanched to be used in cooking in order to remove the toxins from the stinging hollow needle like hairs, taste a lot like spinach and are full of vitamins and minerals. Why not just eat spinach you ask? The whole process of battling this wild plant is fun. It is a challenge. Why not get to know some of your wild edibles, especially those that are abundant not endangered, long seasoned and often free. I do admit that my first sip of nettle soup was taken with a great deal of trepidation. I waited for my throat to sting wildly. It did not. 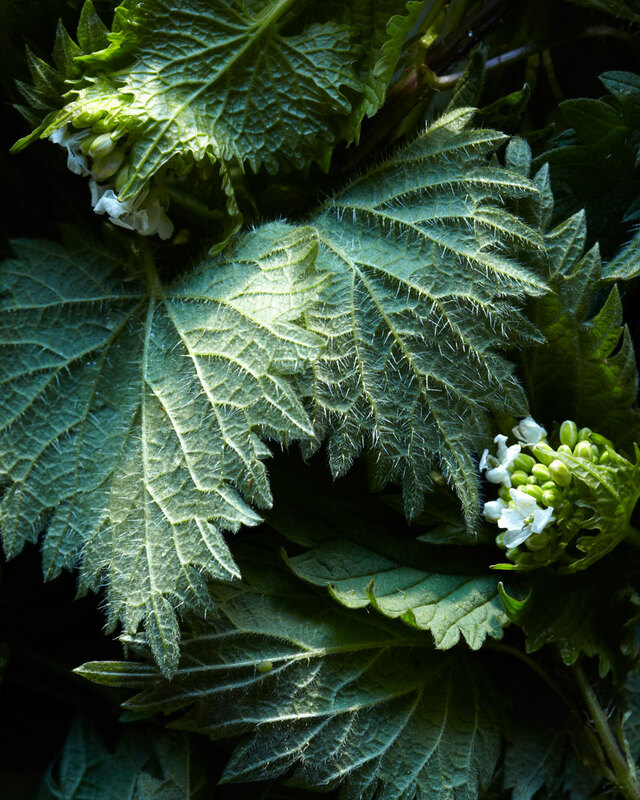 Nettles are one of the first plants to show up in the early spring thereby making them an attractive and green food source after long winters for settlers and Native Americans. There are many benefits to this little weed that outweigh it’s stinging reputation. As well as from being good for you, the fibers of the plant can be used to make a textile similar to linen, it’s roots can be used to make a vibrant yellow natural dye. Nettles are rich in nitrogen, which makies them an excellent compost activator and of course they taste good! Wear long pants and long sleeves to harvest your nettles and always wear gloves! Clip the top tender most leaves of the plant, throw them into a brown paper bag for transport. When you get them home put the gloves back on and throw them into a salad spinner to wash away any dirt or little critters. When you transfer them to the pot to blanch them wear gloves! They are not safe to touch until they have been blanched or if making tea after they have been put in the boiling water. 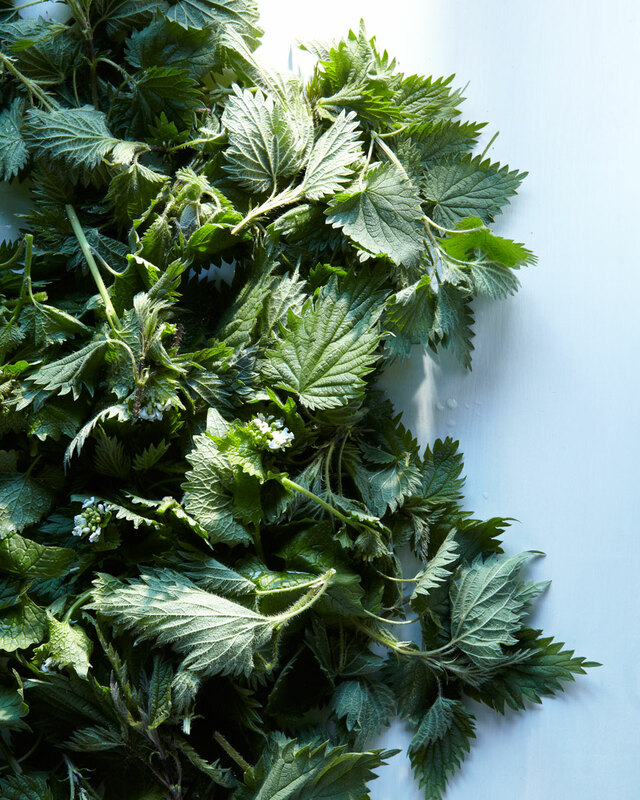 These days, Nettles are popping up on menus all over the country. You can most likely find them, if you prefer to be less adventurous than gathering them yourself, from a local forager or wildcrafter or local green market. I might just declare this nettle week here at hungry ghost and shoot them all week long! I did not gather these nettles myself as the weather upstate is still a bit cold on our side of the mountain. I got them both from a wild food gatherer and from a stall at the Union Squre Green Market. Because nettles shrink so much, like any green when cooking, you will need much more than you would think you would need. I look forward to gathering some near my own blackberry bushes once the sun finally shines on delaware country. Keep in mind if you gather in the wild to always positively identify a plant before consuming it! Set 8 cups of water in a large pot to boil. When boiling (with gloves) add your stinging nettles to blanch. Quickly remove them once blanched and plunge them in an ice bath. Squeeze the excess water from the nettles and set them aside ( they will be a mere shadow of their former self at this point. greatly reduced in volume. 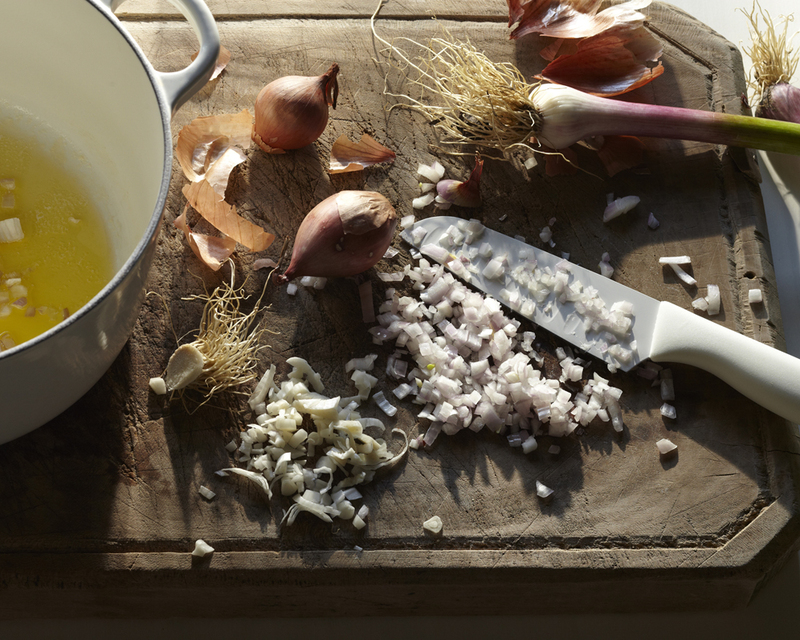 Chop the spring garlic bulb and the shallots into small pieces. Add the butter to a medium size soup pot and melt over a low heat. Add the onion and the garlic to sautee until just translucent and soft. Chop the ball of blanched nettles into coarse pieces. Add the chopped nettles to the melted butter and sauteed onions and return to a low heat, Cook for two minutes stirring constantly. Add the quart of chicken broth and simmer the onions, garlic, nettles and broth for twenty or so minutes until the nettles are very soft. Remove from the heat and puree the whole mixture in a blender. Run the soup mixture through a fine sieve o remove any large particles. Return the soup to the pot and heat to serve. Garnish with garlic mustard blossoms and fresh cracked pepper. Serve with a hard boiled egg and some ramp butter on your favorite bread!